You only need to look at the anger and frustration on social media after the latest Premier League defeat to gain an insight into the current mood at Swansea right now. The Jack Army have become disillusioned following a number of decisions on an off the pitch that have undermined all the hard work that was put in to establish the club in the top flight. There is no question that the fans will continue to get behind the team, but the fractious relationship between themselves and the American owners will do little to improve Swansea’s precarious position in the league table. Furthermore, placing the blame at Bob Bradley’s door will not help either, especially when you could argue that a number of players are failing to pull their weight this season and need to fight for the cause. Remaining united is the only way that Swansea will get themselves out of their current predicament, but with Betway growing increasingly certain that the team are relegation candidates in the latest football odds, a strong reaction needs to arrive sooner rather than later. 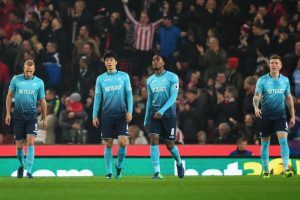 Watching former Jack Army favourites Joe Allen and Wilfred Bony be the difference for Stoke in their 3-1 win at the Bet365 Stadium was painful enough, but the manner in which Swansea slumped to defeat was a major concern. Few would have complained if the scoreline was more comprehensive in Stoke’s favour, with all three goals coming from defensive errors that could easily have been avoided. Alfie Mawson struggled in his second Premier League appearance since arriving at the club from Barnsley in the summer, while Ki Sung-Yeung and Leroy Fer were comprehensively outfought in the midfield battle. The latter of the two appeared more interested in complaining than fighting for the cause, and although Gylfi Sigurdsson and Fernando Llorente appear to be forming a good understanding further upfield, Swansea are unlikely to get themselves out of danger any time soon if Bradley cannot find the answers to solve the lack of shape at the back and discipline in front of them. Bradley has walked into a difficult situation at the Liberty Stadium, and although some have been quick to write him off due to the fact that he has no Premier League experience, he deserves the opportunity to see if he can transform Swansea’s fortunes around. We may have better odds on home turf to pick up results that would lift the club out of the relegation zone as the Swans usually play much better at the Liberty, but not only have the team picked up just two points from a possible fifteen so far, Jose Mourinho and Manchester United are next in town. Facing the likes of Paul Pogba, Zlatan Ibrahimovic and Marcus Rashford is a daunting prospect, even if they are not exactly in the best form themselves. There is hope in the fact that Swansea have won the last previous two meetings between the sides (both of which were 2-1), but the fact that Betway have backed Manchester United as favourites would sum up the lack of confidence in Swansea’s ability to pick up points amidst the doom and gloom. Admitting that Swansea are in a relegation battle may be a sign that Bradley is honest about the work that lays ahead of him and his team, but it could also stem from taking one glance at the run of difficult upcoming fixtures. However, the upcoming international break which follows the game against Manchester United should give the manager invaluable time on the training ground to assess where it is going wrong, implement his own ideas and try to lift the confidence in the camp. It could prove crucial, given that Swansea travel to Everton in the first game after the break before coming up against Crystal Palace (H) and Tottenham (A) in a run of fixtures that few would thank you for. Those may provide few opportunities to put vital points on the board, but as Swansea then face Sunderland, West Brom and Middlesbrough before Christmas, those three games could ultimately make or break our season.